Summarize the benefits of a self-service community. Describe the types of information to include in a knowledge base. Explain what macros are, what they can do, and how to run them. Think about a world in which your service agents have all the information they need at their fingertips—enabling them to resolve cases and rarely escalate cases to a manager. A world where your customers can answer their own questions, or even help solve tough cases. And what if you never had to think about your case management processes, because they just worked? Imagine how much easier service delivery can be! With the Service Cloud platform you can have all of that, and we show you how. Build your own branded community quickly and easily using Community Templates. Because the Service Cloud platform connects your service and sales, you can infuse your community with data from any system, anywhere. 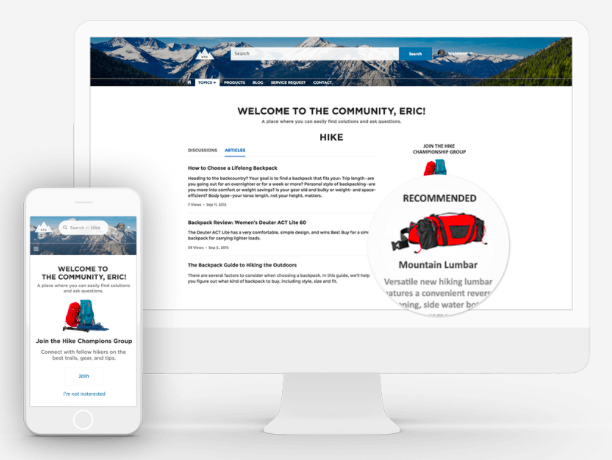 With Community Cloud, you can automatically recommend experts, groups, and content with the artificial intelligence (AI) of Salesforce Einstein. But what does that really mean? Customers can actually create and resolve cases on their own, but they also have the advantage of escalating support cases instantly if necessary. And of course, your agents can access and share the customer information they need with a click, right from the Service Console. Customers and agents can share best practices, answer frequently asked questions, and identify common problems customers are experiencing—and fix them faster than ever before. Assign your most knowledgeable agents to monitor the community chat room. You can get valuable real-time information about what customers really want. And you can deepen the customer relationship, while helping to gain priceless ambassadors for your brand. Whether it’s customer self-service, or agents looking for the right answer fast, the Service Cloud platform integrates your entire knowledge base into your service website and into the Service Console. What exactly do we mean by knowledge ? Simple. You build your knowledge base by instantly sourcing information from the collective wisdom of your company. While there can be several types of information in your knowledge base, we refer to all of them as articles . An article can be made up of anything from frequently asked questions such as “How do I find replacement parts?” to information on a process, such as how to reset product defaults. Here’s how it all fits together. Automatically apply filters to search, identify, and verify articles, letting agents and customers vote on the quality of articles. Knowledge is embedded in the Service Console, so agents can search and share articles with one click. Knowledge is integrated into your service website and customer communities for an effortless customer experience. Not sure what a macro is? It’s an amazing productivity tool for agents. Imagine having the ability to group a set of instructions to complete a task that a support agent normally needs to do manually and triggering them with the click of a button (or a keystroke). That’s what macros do. They’re easy to set up in the Service Cloud platform, and they save agents lots of time by automating repetitive tasks so that they can spend more time solving customer problems. Open a case in the Service Console. Navigate to the case status field. Repeat steps 1–4 with the next case. Select one or more cases in the Service Console. Run the macro on them all and have the macro do the work for you. That’s it! Imagine the time your agents save using this very simple macro over the course of a week, a month, or the year (multiply that by all your agents). Phew! There are plenty of other ways that macros can help agents save time. Check out the resources section below for examples of popular macros. Now you’ve learned the fundamentals of the Service Cloud platform case resolution tools, and how they can make your service agents work smarter and faster. In the next unit we show you how your entire contact center can work smarter with Omni-Channel Routing.